(Nanowerk News) Nanophase Technologies Corporation announced today the opening of a new polishing laboratory that will enable new product development and provide customer application support and process simulation for a variety of demanding optical and precision surface finishing markets. The new laboratory will allow Nanophase scientists to partner with their customers to solve industry challenges using the company’s proprietary high performance polishing slurries. Nanophase has invested in sophisticated polishing, cleaning and metrology equipment for the laboratory, many of which are the same tools that customers use in their own optics manufacturing processes. This equipment includes a PR Hoffman PR-1 double-sided polisher, a Lapmaster 12 pitch polisher, a Zygo profilometer and interferometer and an advanced ultrasonic cleaning line. Additionally, Nanophase has extensive experience and in-house capability for particle size measurement, determination of colloidal stability and a variety of other wet chemistry analytics. “Our new polishing laboratory allows us to demonstrate the tremendous value of our innovative polishing slurries to our customers without asking them to interrupt their own production to run experiments,” said Patrick Murray, Ph.D. chemist and head of the Nanophase Research and Development team. 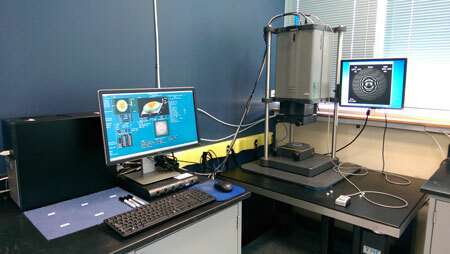 This image shows the ZYGO Verifire™ XPZ interferometer system. Nanophase precision polishing slurries offer improved product longevity, more rapid time-to-surface-finish and access to improved surface finishes, along with reduced defectivity. Operated by a team of chemists with advanced technical degrees, the new laboratory can also be used to simulate, diagnose and troubleshoot customers’ production problems, especially those involving removal rate, surface quality and cleanability. Variability in results or changes in product performance often occur when slurry vendors do not manufacture their own particles and do not understand the importance of the interactions of the particles with the slurry chemistry and the substrates. Nanophase manufactures all of its own polishing slurries and has a robust quality infrastructure to ensure product consistency. Murray will present a paper, “Optimizing Double-sided Glass Polishing Using Rationally Designed Experiments,” on Nov. 10, 2014 at the Tucson Technical Workshop presented by the American Precision Optics Manufacturers Association (APOMA). For more information on Nanophase’s optical polishing capabilities, visit http://nanophase.com/markets/optical-surface-polishing/. Nanophase Technologies Corporation, located in Romeoville, IL, is a global provider of engineered nanomaterial solutions across a broad range of markets, including personal care, coatings, energy storage and surface finishing. Using a platform of patented and proprietary technologies, the company develops and manufactures products from two ISO certified facilities that enable our customers to create sustainable, competitive advantages and expand into new markets.